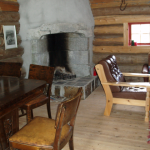 EldhusThe old timber bakery house has a double bed, a children’s bed, a fire Place and a table With chairs. UtsiktenUtsikten is a modern wooden house with a double bed. Suitable for 1-2 persons. Stabbur 1. etg (ground floor)In the old timber food storage house is a family room with a double bed, 2 bunk beds and a cosy sofa sitting group. Ceiling height 169cm. Stabbur 2. etg (1st floor)The mixed dormitory has 8 bunk beds. Here you share the room with other travellers. It’s also possible to book the whole room. TentIf you bring a tent, we have tent sites in the garden. 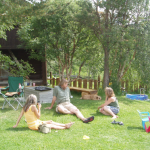 All our guests share kitchen, toilet and shower facilities, all situated in the basement of the farmhouse. Free coffee and tea for all visitors. In the kitchen there are books and tourist information. All beds have a reading lamp, and in the garden we have barbeque facilities. Do you wish to start the day with a breakfast basket? We can make you a basket containing bread, butter, jam, cheese, juice, milk, coffee and tea. Remember to tell us the evening before. If you want to book a room or check availability, please use airbnb. You will find links to the rooms here.